It is our mission to inspire and enable all young people, especially those who need us most, to realize their full potential as productive, responsible, healthy and caring members of society. The Boys & Girls Clubs of the Midlands is a leader in youth development on the local and national level. We are transforming our community by providing youth with impactful, fun and educational opportunities in a safe environment. These opportunities are led by professional, positive role models and often in collaboration with community partners who help make a lifelong impact in the lives of those we serve. Clubs provide a fun, safe and constructive environment for kids and teens during out-of-school hours. 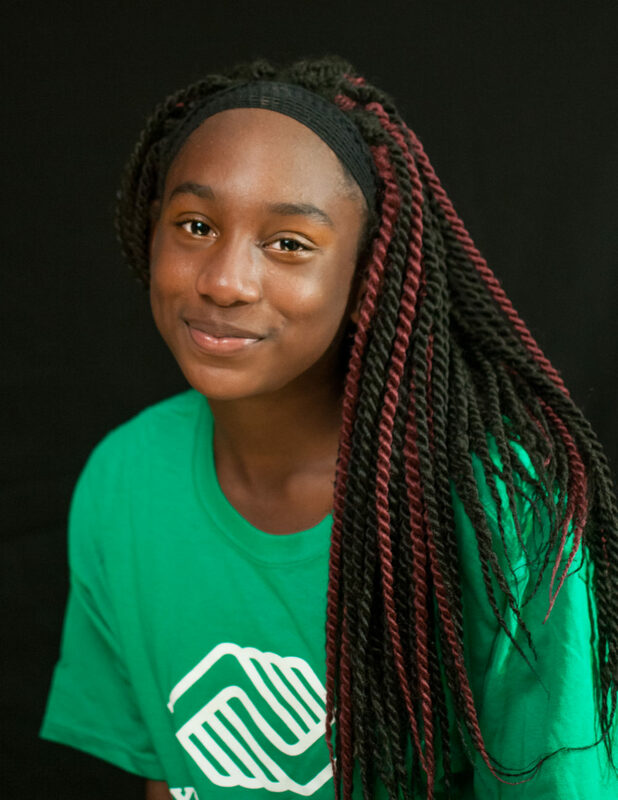 Serving more than 7,000 youth across 13 locations in Omaha, Carter Lake and Council Bluffs, Boys & Girls Clubs of the Midlands’ programs are led by professional and caring staff. Each Club offer programs and services to help young people succeed in school, develop leadership skills, and maintain healthy lifestyles. Boys & Girls Clubs are staffed by passionate youth development professionals. As caring mentors and program facilitators, they build ongoing, supportive relationships that foster a sense of belonging and purpose for young people every day. Clubs offer a variety of tested, proven and nationally recognized programs designed to empower kids and teens to excel in school, become good citizens and lead healthy, productive lives. 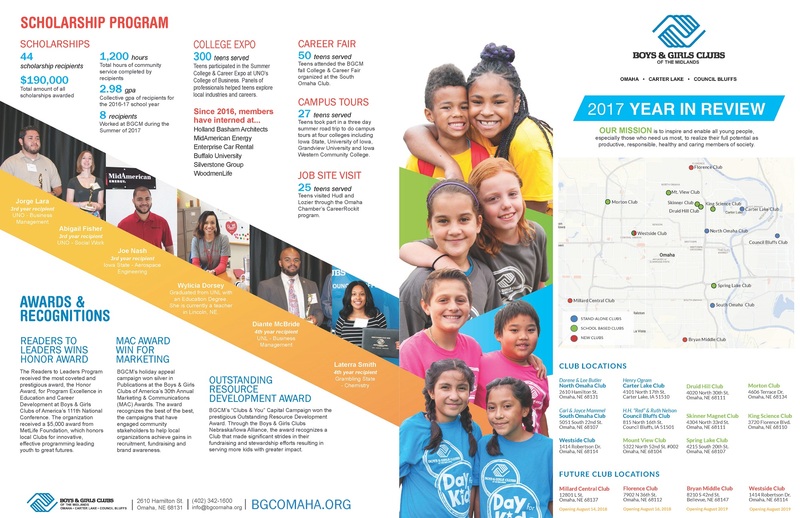 Programs are tailored to the local community and customized for each age group to meet the interests and developmental needs of young people ages 6-18. 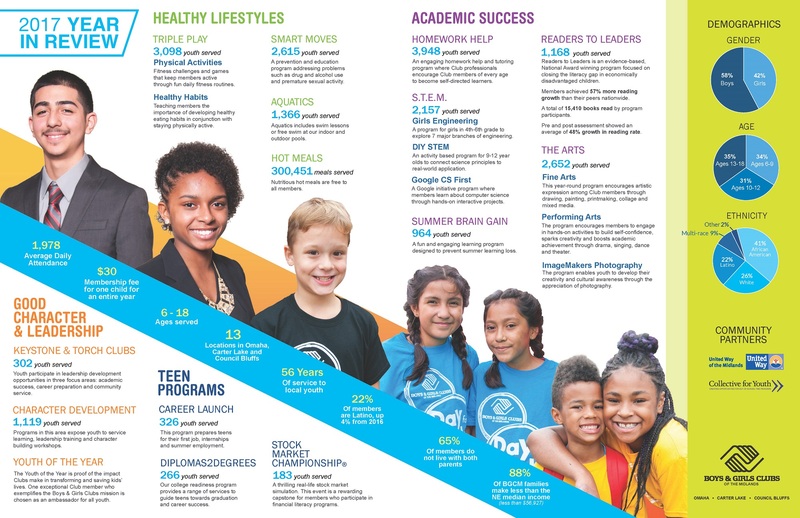 For more than 56 years, Boys & Girls Clubs of the Midlands (BGCM) has delivered on our promise to provide metro area youth with the support needed to reach their full potential. BGCM has a proven and effective approach: provide youth with a positive, accessible place to go; surround them with trained and supportive staff; and offer results-oriented programs that are educational, recreational and age-appropriate. We currently operate 13 Clubs in the metro Omaha and Southwest Iowa area, in addition to Camp Nakomis, a summer camp that provides a positive, challenging outdoor experience to the youth within our community. Historically, BGCM has purposefully located Clubs in areas of high need in order to have the greatest impact on the lives of at-risk youth. Currently, we serve over 7,000 children and teens, many of whom are minorities, economically disadvantaged and live in single-parent households. BGCM’s goal is to deliver programs that create happy and healthy children today while building a foundation of success for tomorrow – impact for a better future. This begins with the imperative to provide a safe environment that keeps kids engaged, active and happy in the hours after school, during vacation periods and throughout the summer months. Research shows that during periods of idleness and boredom, kids are vulnerable to peer pressure, violence and other risky activities. The risks are even higher for children from disadvantaged circumstances. We minimize those risks by engaging young people in activities with positive adult role models and peers, enabling them to learn powerful life skills.